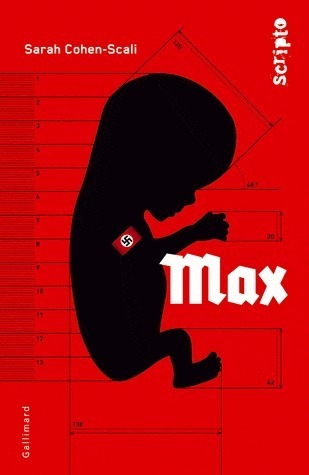 Max is a perfect example of the Aryan race; he was engineered to be so as part of the Lebensborn program in Nazi Germany in 1936. Max starts telling the story of his exceptional creation while he's still a fetus and continues until he is ten years old. During that time, he stays true in his unfailing commitment to his "father", Adolf Hitler, while he helps in kidnapping and indoctrinating children from other countries, learning the ways in which Jews are ruining Germany, and preparing to be a soldier for the Nazis. His belief in the master race is somewhat shaken by Lukas, a boy who looks to be the perfect Aryan in every way but reveals himself to be a Jew who is not above murder to avenge the deaths of so many others. Lukas and Max bond despite their completely different ideologies as the truth about the Third Reich begins to come to light and Berlin falls to the Russians. Other reviewers have said they had a very difficult time with the fetus as narrator but I am okay with that device as it provided a first person perspective of the Lebensborn program and the nonchalant way in which it was implemented. In fact, I was all in for the first section of the book which used Max to show how completely so many people were brainwashed into believing the truly horrific tenets of Hitler's program. I think that hearing what was happening from a person who had no issues with what was happening is much more powerful than viewing it from an outsider, judge-y perspective. But I got bogged down as the book went on. It moved slowly and I never felt invested in either main character. As a way to examine the hundreds of atrocities perpetuated by the Nazis - even above and beyond the death camps - it is a good primer. The book also shows the reality of the Russian liberation of Germany which was also brutal. But it failed to draw me into the human element which made finishing it a chore.